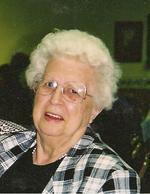 Glada A. Dininger, age 91 of Ashland, OH., passed away Saturday, February 18, 2012 at her residence. On May 20, 1920 in Richland Co., OH., Mrs. Dininger was born to Dewey and Nellie (Craighead) Lybarger. She had been a resident of Ashland the past 10 years and formerly resided in Richland Co. most of her life. Mrs. Dininger retired after 35 plus years from Ohio Brass and formerly attended Grace Brethren Church of Ashland. On August 23, 1940 Glada married Russell Dininger who preceded her in death March 17, 2002. She is survived by a daughter and son-in-law: Beverly and Denny Lukity of Ashland; two grandchildren; and four great-grandchildren. Mrs. Dininger was preceded in death also by four sisters and two brothers.